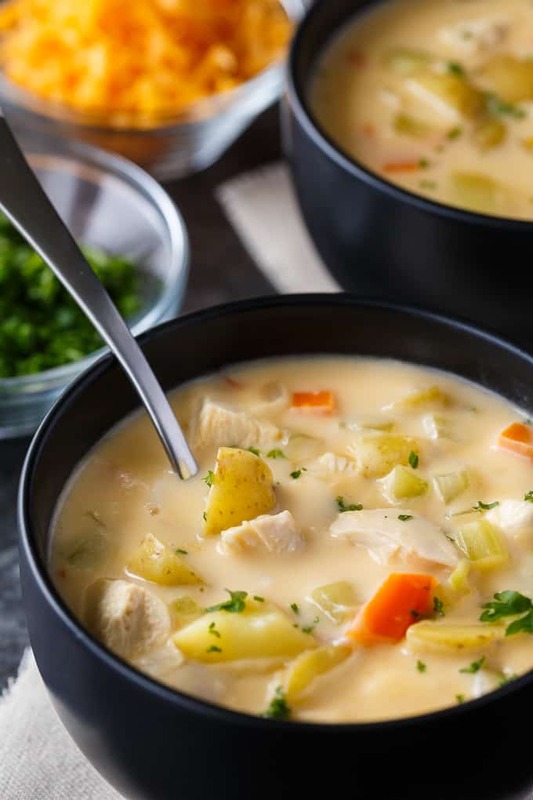 Cheesy Chicken Chowder is hearty and delicious! 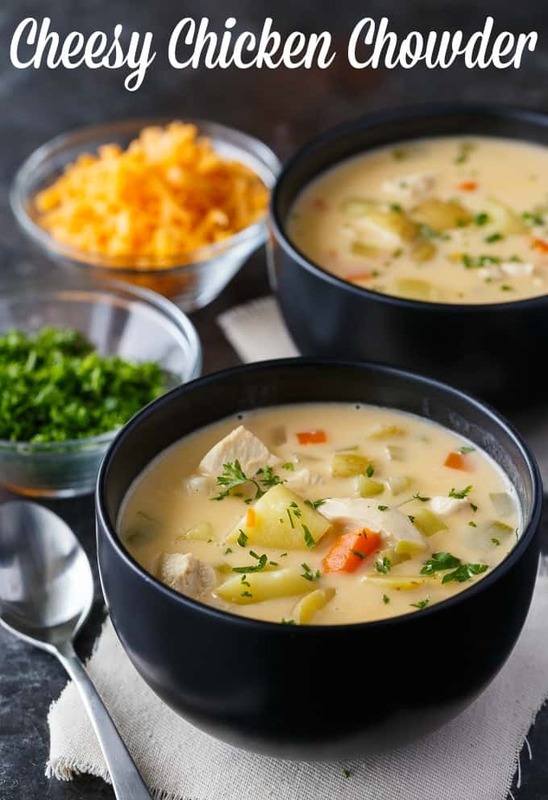 This creamy soup is loaded with chicken, potatoes, carrots and lots of cheese. 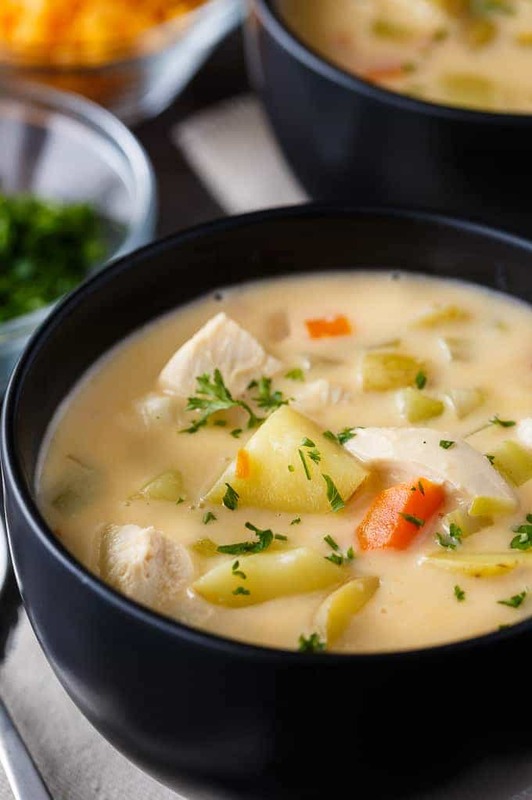 It’s the perfect comfort food to enjoy on a cold day. When the first snowfall hits, all I want to do is stay indoors cuddled up with a blanket and a book. I’m not crazy about winter, especially winter driving, but it’s a given living here in Ontario, Canada. So I endure….with delicious comfort food meals. 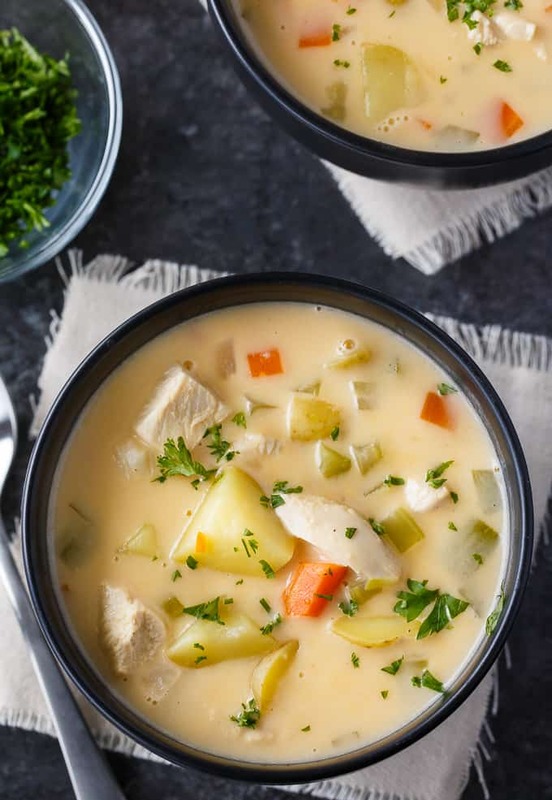 One of my favourite soups lately is this Cheesy Chicken Chowder. It’s creamy, perfectly seasoned and full of flavour with tender morsels of Canadian chicken breasts. When I’m shopping for ingredients, I’m always looking for quality. They can make or break a recipe. I want the freshest ingredients possible. Buying Canadian chicken is important to me. I know I’m getting a quality product that has been raised to a set of mandatory national food safety and animal care standards. All Canadian chicken is grain-fed and free of hormones and steroids. These things matter! How to know for sure you are getting Canadian chicken is to look for the “Raised by a Canadian Farmer” mark on the packaging. This way you know 100% that the chicken you are buying is raised to these high standards. 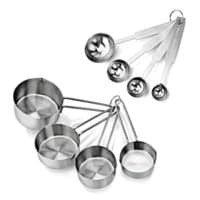 Along with quality ingredients, time saving recipes are also important. Who wants to slave away in a kitchen? I’d rather be curled up on the couch with a book and some hot chocolate. The great part about this recipe is that you can prep the ingredients ahead of time. Chop up the veggies and cook the chicken and put it in the fridge until you are ready to make it. The first step is to add the chicken broth, potatoes, carrots, celery, onion, salt and pepper to a large saucepan and bring to a boil. Cover the pot and simmer over medium low heat for 30 minutes. In a small saucepan, melt the butter and add the flour. Stir to combine. Gradually add the milk and cook until slightly thickened. Stir in the cheddar cheese. Add the cheese mixture and cooked chicken to the broth and stir. Cook over medium heat until heated through. Serve it hot with fresh parsley, if you wish! 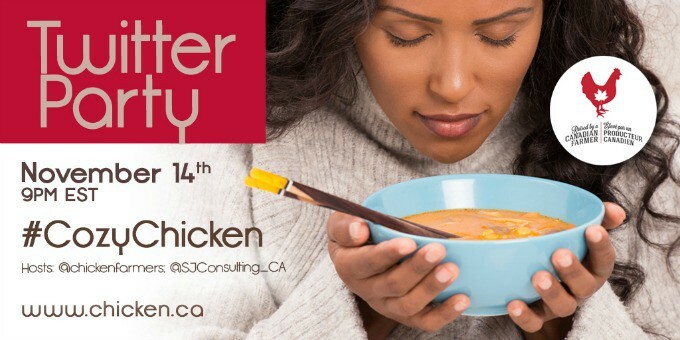 For more yummy recipes from my friends at the Chicken Farmers of Canada, check out Chicken Lasagna Soup, African Peanut Chicken Stew and Broccoli Potato & Chicken Soup. Connect with the Chicken Farmers of Canada on Facebook, Twitter,Instagram and Pinterest. Hearty and delicious! 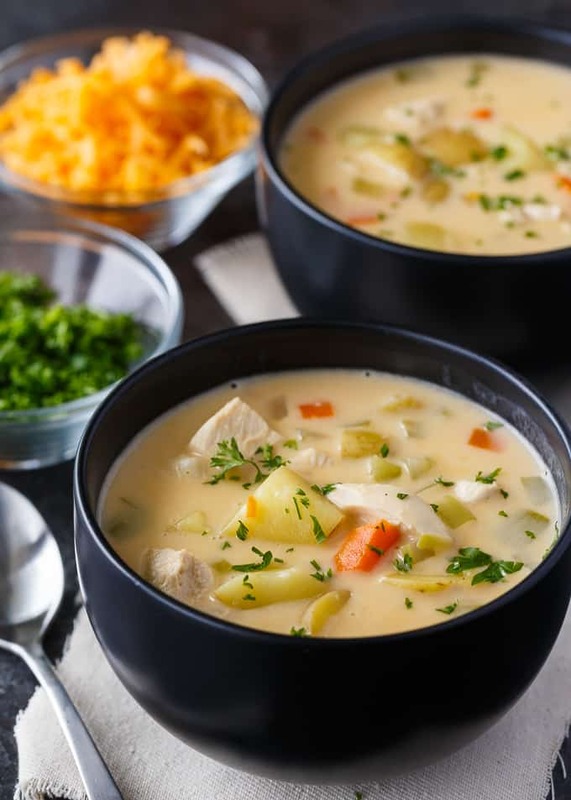 This creamy chowder is loaded with chicken, potatoes, carrots and lots of cheese. 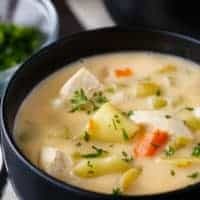 Add chicken broth, potatoes, carrots, celery, onion, salt and pepper to a large saucepan and bring to a boil. Cover and simmer for 30 minutes. 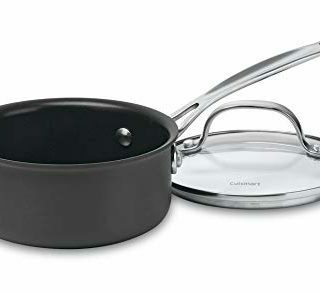 In a small saucepan, melt butter and add flour. Stir together. Gradually add milk and cook until slightly thickened. Stir in cheddar cheese. Add cheese mixture and chicken to the broth and stir. 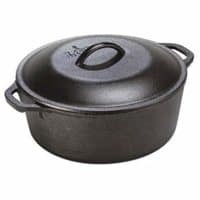 Cook over medium heat until heated through. Serve hot topped with fresh parsley, if desired. Join the #CozyChicken Twitter Party on November 14th at 9pm EST! Eligibility: Open to Canadian residents, 18+. Official rules. 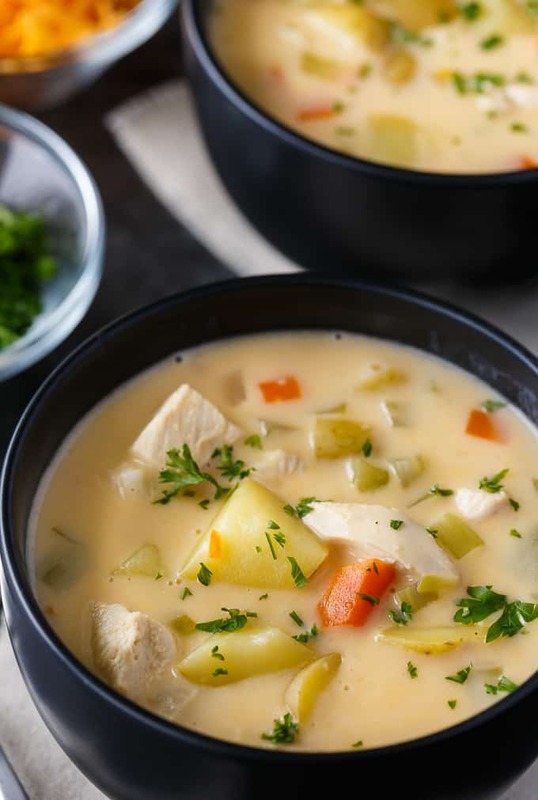 This cheesy chicken chowder looks so good and hearty. I just realized how hungry I am! Wish that I could get a dish off of your blog. Found you at Tasty Tuesdays. Oh wow; that sounds amazing! Pinned. 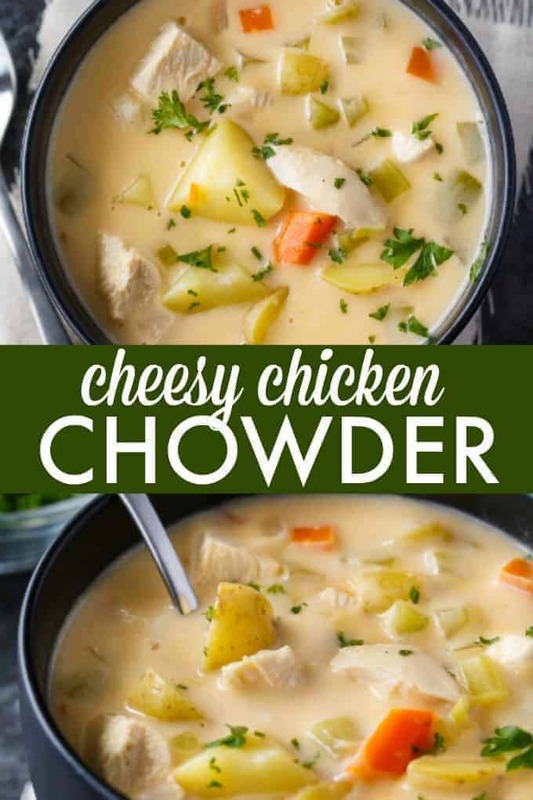 The cheese puts this yummy chowder way over the top! It looks amazing! Thank you for sharing at Celebrate it!